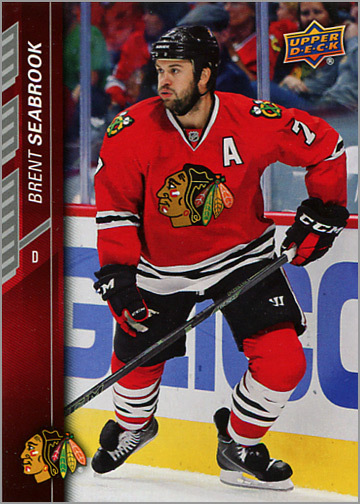 Seven exclusive Chicago Blackhawks trading cards, made by Upper Deck, were given away at a Blackhawks game during the 2015-16 season. At a glance, these closely resemble the standard 2015-16 Upper Deck hockey cards found in packs of Upper Deck Series One and Series Two. 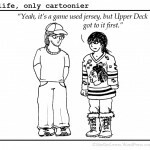 However, upon closer examination there are several notable differences. 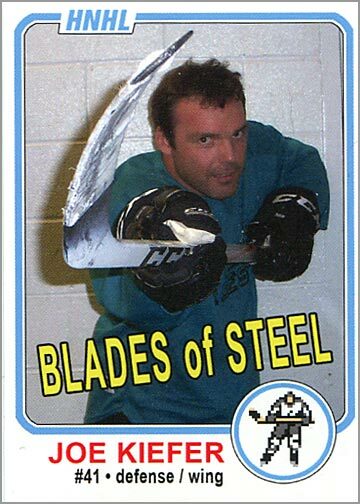 Furthermore, some cards even use entirely different photographs, making for an odd, offbeat parallel for team or player collectors. 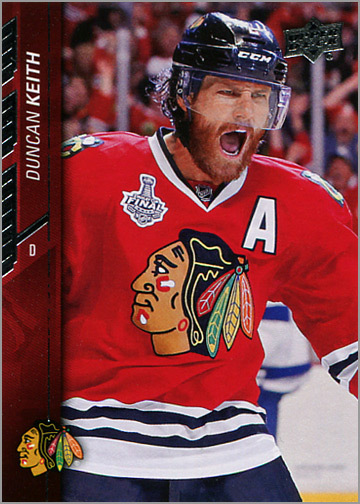 Six trading cards and one “Special Offer” card came sealed in polybags and were given away before a Blackhawks 2015-16 home game. 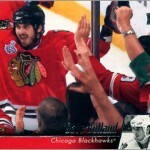 Six trading cards and one “Special Offer” card were packaged in clear wrappers and given out before a Blackhawks game. 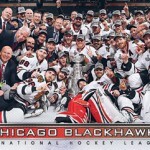 I don’t know the exact date, as this giveaway was not on the team’s initial promotional schedule. 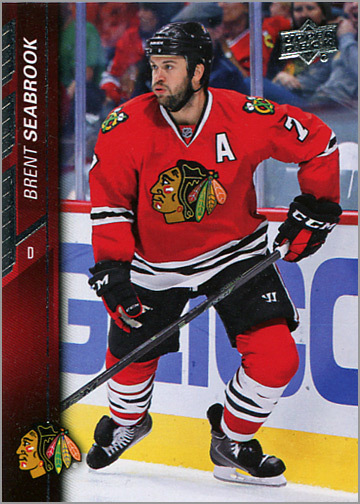 Likewise, I’m not sure about the print run of these cards, but my best guess is that they were given out to the first 10,000 fans, as Upper Deck trading card giveaways in previous years were limited to 10,000. 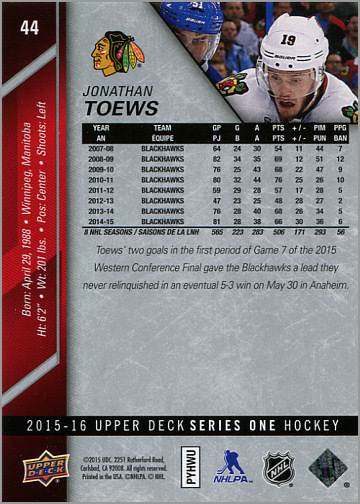 The Special Offer card advertises that a seventh card, of Blackhawks team captain Jonathan Toews, could be obtained for free if you purchased any Upper Deck product from the team store at the United Center. Packs of Upper Deck cards are two to three times what they’d typically sell for. 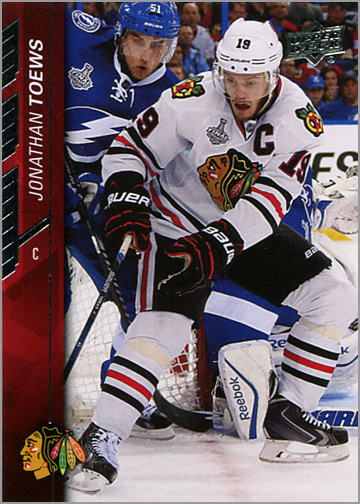 My friend that got me these cards — a ‘Hawks season ticket holder — paid $5 for a pack of 2015-16 Full Force to get the Toews card. 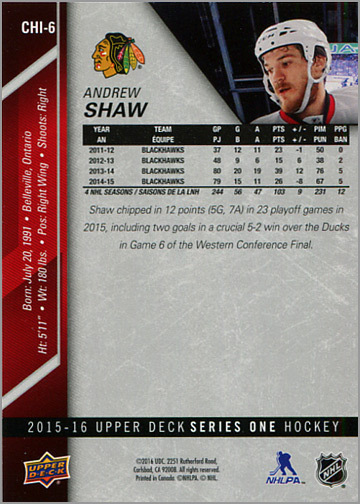 Fronts of the cards lack the silver foil that normally adorns Upper Deck trading cards. The silver Upper Deck logo is replaced with the blue, yellow and orange Upper Deck logo. The silver along the sides has been replaced with gray ink. A few of the cards use different photographs. The backs of each giveway card also have some differences. The numbers in the upper-left corner have been replaced with CHI-1 through CHI-7. The anti-counterfeit hologram in the lower-right corner is absent on the giveaway cards, as is the little rectangle with the code. Some cards use different photos on the back, too. 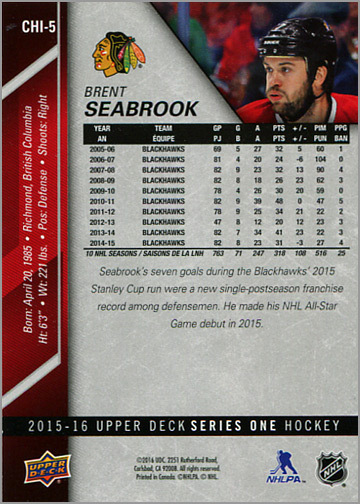 At the bottom, all cars say “2015-16 Upper Deck Series One” — even if that particular card was based on a card from Series Two. The layout of the text under the stats also differs on some of the cards, and is even completely different on one of the cards. Below are comparisons of each card, front and back. Front of CHI-1 and of 2015-16 Upper Deck Series One #43. 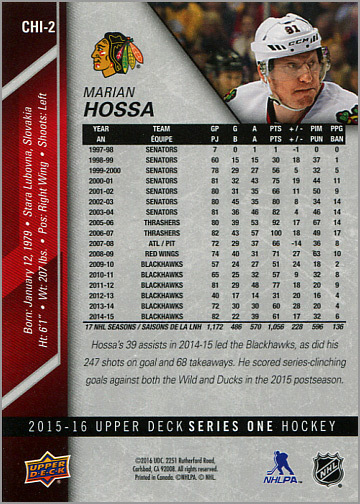 Back of CHI-1 and of 2015-16 Upper Deck Series One #43. 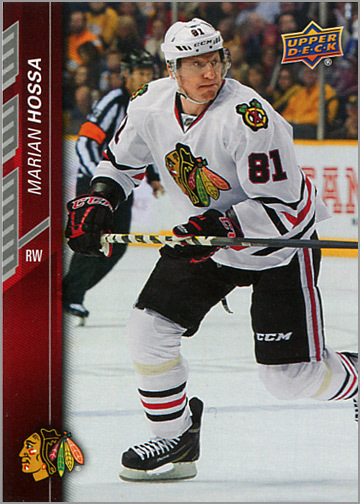 The giveaway card uses a different photo of Marian Hossa, and alters the layout from horizontal to vertical. 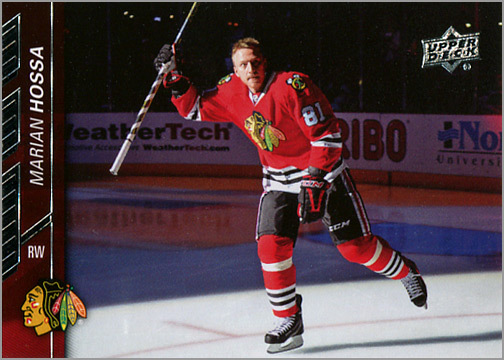 The back of the giveaway card also uses the different photo of Hossa. 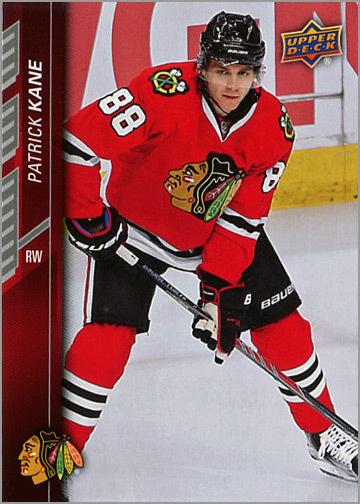 Patrick Kane’s card also uses a different photo. The layout was also altered. 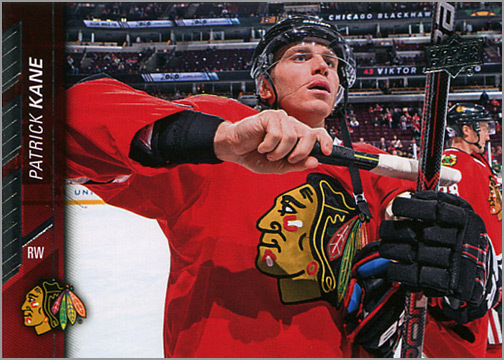 This could be because the photo used on Kane’s Series Two card is kind of odd; is Kane rubbing two sticks together to make a fire? Bad idea; fire melts ice. The short text blurb is also different. 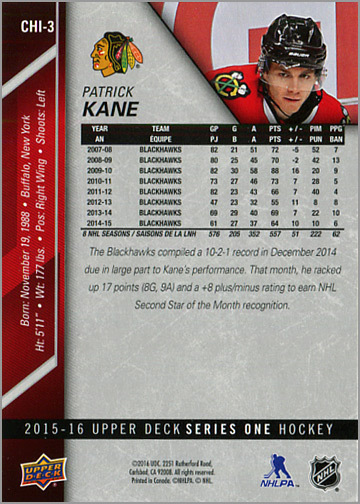 GIVEAWAY CARD: The Blackhawks compiled a 10-2-1 record in December 2014 due in large part to Kane’s performance. 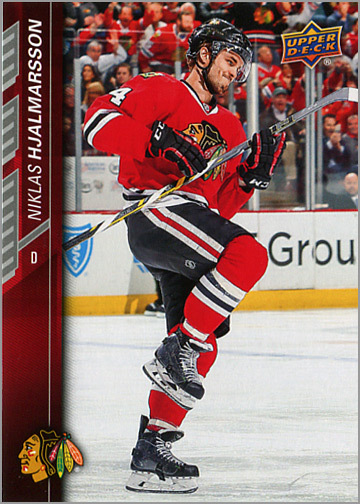 That month, he racked 17 points (8G, 9A) and a +8 plus/minus rating to earn NHL Second Star of the Month recognition. 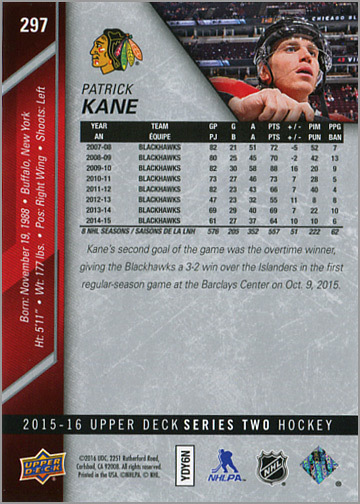 SERIES TWO CARD: Kane’s second goal of the game was the overtime winner, giving the Blackhawks a 3-2 win over the Islanders in the first regular-season game at the Barclays Center on Oct. 9, 2015. 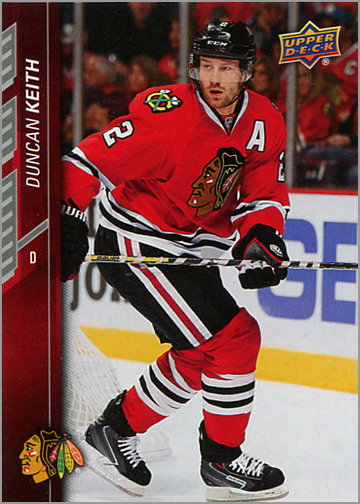 Duncan Keith’s giveaway card is the third card in the set to use a different photo. 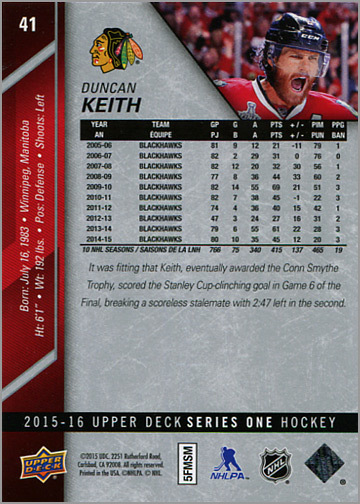 I’m not sure why this was changed, as Keith is clearly amped about something — winning another Stanley Cup Championship, perhaps — on the actual card, whereas the photo on the giveaway is run-of-the-mill. 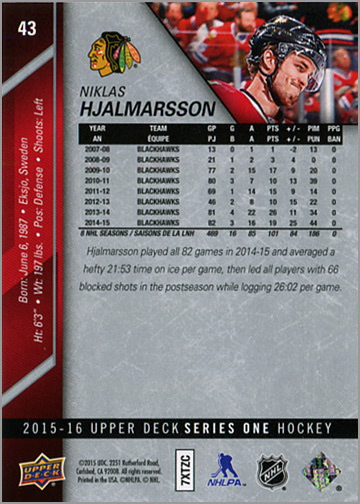 Back of CHI-4 and of 2015-16 Upper Deck Series One #41. 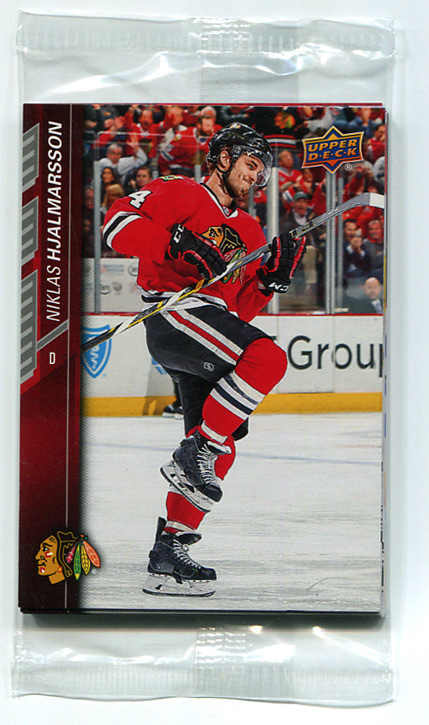 Front of CHI-5 and of 2015-16 Upper Deck Series Two #296. 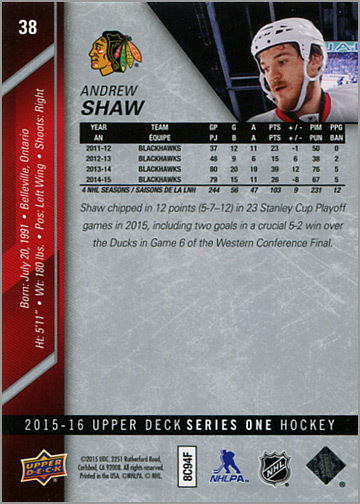 The giveaway card notes Shaw’s position as RW, while the Upper Deck Series One card lists his position as LW. 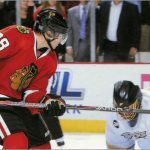 The position change from LW to RW is carried over to the back. 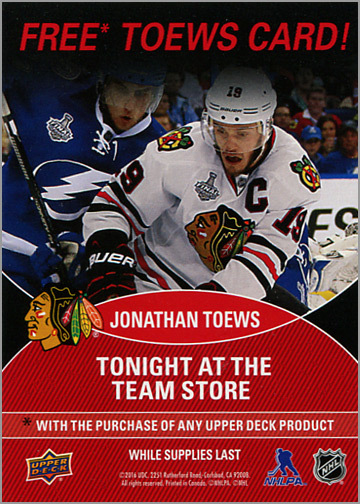 Toews’ card was available in the Blackhawks’ team store during the game. If you purchased any pack of Upper Deck trading cards, you would get one free Jonathan Toews card. 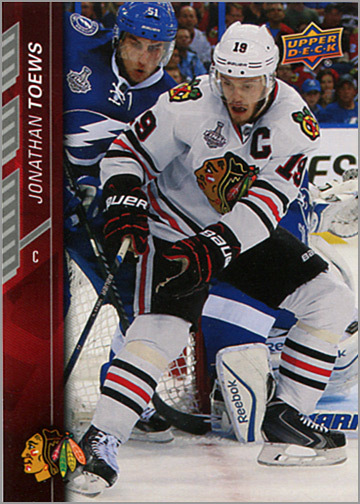 You have to wonder, how many non-card collectors skipped doing this, meaning that Toews’ card might be the hardest one to find, given that it wasn’t actually free. Back of CHI-7 and of 2015-16 Upper Deck Series One #44. 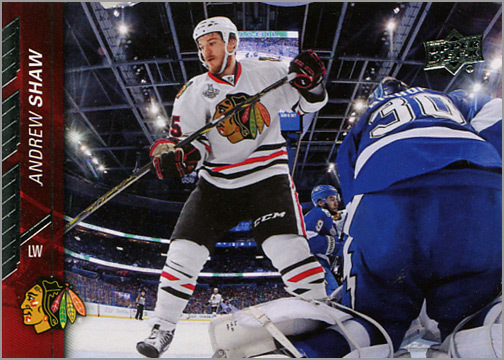 This card was packaged with the first six cards, with the advertisement for the “FREE* TOEWS CARD” facing out so fans could see that a seventh card could be acquired. 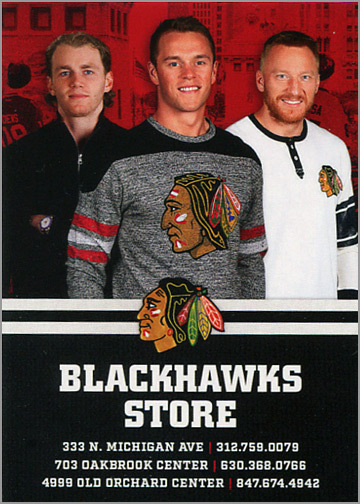 The other side has an ad for the Blackhawks Store — formerly known as “HawkQuarters” to us old school ‘Hawks fans — and shows Patrick Kane, Jonathan Toews and Marian Hossa modeling Blackhawks’ apparel. Special thanks to Joe for getting me these cards.